The journey of influence that someone can have on your life is often circuitous and profound. Such it was for my life and Paolo Soleri. As far back as I can remember Soleri was deeply rooted in the lexicon of our family. Neighbors, we lived just down the road from what is now known as Cosanti. My father, being Italian American, loved the idea of an Italian-born creative-genius architect being in such close proximity and my bohemian mother embraced the ideas of this creative compound so that between them, each and every visitor that came to stay with us got a trip “out to Soleri’s” for an indoctrination to desert architecture that would have been simply unthinkable in any other place but here, often to the confusion of some of the less creative types that came for visits from Detroit. Earliest memories for me include summer nights deeply anchored with the slightly clunky sound of the array of ceramic Soleri bells we had hanging outside my window (this was pre-bronze era) that swayed in the after-breeze of a summer monsoon. We always took them down in the worst of the dust storms in order to preserve them. Not long after, I would go to Cosanti just to watch and learn. Sometimes every day after school, on bike or by foot; often right off the school bus. I was hooked. My time visiting allowed me to see so many of the structures go up that I felt deeply connected to this man and this place. Some afternoons, I would watch him draw for as long as I could: a fluid motion of design. I would bask in the ephemera: a plaster model of a bridge, Plexiglas cities layering up on each visit (to this day some of the most beautiful sculptures I had seen). Art, Architecture, Design, Sculpture, Texture, Form and Concepts…all in one place. I will always remember watching outside his studio, the water fountain and salt tablets near by. Even in the heat…in spite of it. Now completely influenced, I used to practice building “houses” in our yard. Little small “models” of the sort of designs and structures I was introduced to at Soleri’s . Casting mud over formed dirt, then scraping out the open space below, all modeled to “plastic army-man” scale. I was inspired by Soleri even at age ten. Paolo Solari created a place of creative energy that at the time was electric…visible. Things got built. Concepts drawn and modeled. Bells were cast. Assembly. Purpose. There were all the elements of materials I ended up spending a life around; clay…concrete…metal. 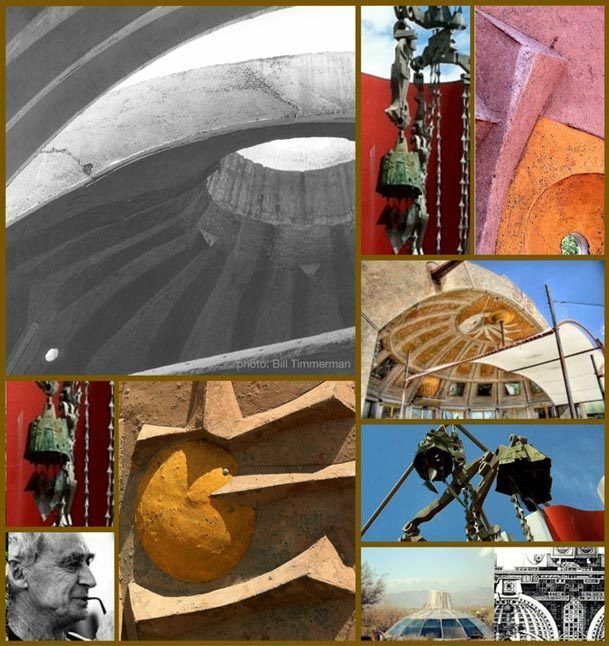 Paolo Soleri worked in the realm of art and ideas. Cosanti became a touchstone. By high school I was convinced that the Soleri way was the future of how to co-exisit with Nature and the Desert. I thought every one would of course desire to build and live like that! How I never ended up there as a student/apprentice is beyond me, but life takes a path of many choices. Because of my age I slipped in and out effortlessly at Cosanti and frankly unnoticed. As often as I was there I can’t say as Paolo ever really knew me beyond a level of basic recognition or even remembered our family visits. Yet graciously he would always acknowledge me as we’d see each other through the years and exchange pleasantries. He never knew it, but I was his student as much as any other, and he was my unacknowledged teacher. As I am forever grateful for the introduction of ideas that opened my creative mind to ideas and a method of learning that have since served me well. Ciao Maestro! Grazie Mille! Paolo Soleri was one of us. An Arizonan. A man who left a mark here. An Architect of the “Desert School” before there even was one. I was proud to see him about, to share his ideas, to have him as a neighbor and unknowing instructor. I will miss his physical presence but take solace in remembering his legacy built and unbuilt. Sometime soon in respectful memory of Paolo Soleri, we must all find a particular time and date in this Valley to make all of our bells ring in collective unison. There must be thousands Valley wide- I think it would be a nice tribute… In the still of night, how many would we hear?